D. L. (Doris Leon) Menard was born April 14, 1932 in Erath, Louisiana. The only child of Acadian farmers, Menard worked in the cane fields and the cotton fields of south Louisiana as a young child. At night, he would listen to an old battery powered wooden radio and tune in country stations from Del Rio, Texas and KWKH in Shreveport, Louisiana, home of the then famous "Louisiana Hayride." He learned to sing country tunes in English long before he sang in French. His father was a popular harmonica player and his uncle played guitar. Menard purchased his first guitar from a Sears Roebuck catalogue when he was 16 years old and asked a member of his uncle's band to teach him how to play basic chords. A year later, he played his first Cajun dance for pay at the Palombo Night Club in Abbeville, Louisiana. He has been playing music and writing songs ever since. In 1951, the 19-year-old Menard had the opportunity to meet and talk to his long-time idol, Hank Williams Sr., at the Teche Club New Iberia when Williams performed there. Williams encouraged Menard to be proud of his heritage and play his own type of music. Hank Williams Sr. told Menard, "All music is good if it's yours." Those simple, yet profound words have stuck with Menard all of his life and have indeed proved to be very helpful. Today Menard is an accomplished guitarist, vocalist, songwriter and composer. He has visited 33 foreign countries such as France, Italy, Thailand, Norway, Brazil, Germany, Egypt and Japan due to the success of his best known song, "The Back Door," or, as it is pronounced in French, La Porte en Arriere. Folklorist at the University of Louisiana at Lafayette, Dr. Barry Ancelet, has said that The Back Door is the most often played and recorded Cajun song. He has performed for Mayors, Governors, Ministers, Congressmen and Presidents. As a goodwill ambassador, D.L. Menard has received some of the most important awards in music and culture, including a Grammy Music Award nomination for the "Best Traditional Album" in 1993. 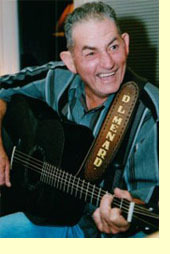 His Lifetime Achievement Award denotes Menard as a Master Traditional Artist whose influence on generations of Cajun musicians has been immeasurable. He is in the Louisiana Music Hall of Fame, and the Cajun Music Hall of Fame. In 1993, D. L. and his "Louisiana Aces" band received the Times Music Award. In 1994, he received The National Heritage Fellowship Award from the National Endowment for the Arts, their highest honor, along with ten thousand dollars, which was presented to him by First Lady, Hillary Rodham Clinton. Warren Perrin, President of CODOFIL said, "D.L. has been a good will ambassador for the Cajuns of La. for many years. He possess all of those traits that people admire about our culture; dedication, humor, perserverance, intergrity, generosity and candor. His love of his culture is inspiring to all who know and love him."